The name peperomia may not roll off the tongue, but you could get lost in this wonderful genus of tropical plants: there are more than 1000 known species, all with thick, fleshy leaves that contribute to their drought tolerance and vigor. If you haven't experienced much luck with flowering houseplants, you will appreciate that the peperomia sports foliage that is highly ornamental in its own right. Leaves may be textured or smooth; red, green, gray, or purple; variegated, marbled, or solid; large, heart-shaped, or tiny. Plants throughout the peperomia genus may look so different from one to the next, that it's difficult to discern if they are even related, but one thing all peperomia plants have in common is that they are slow-growing and low maintenance. The peperomia plant is a smart choice for the beginning houseplant enthusiast. Not only are they forgiving plants that tolerate some benign neglect, but the spectacular variety of colors and textures between species means that you can amass an interesting collection of plants for every style and space, all of which require the same care. Peperomia plants need medium to bright light to maintain their vibrant foliage colors. Morning light and filtered light is fine, as well as 12 to 16 hours of artificial light. Insufficient light will result in fewer leaves, leaf drop, and drab coloration. Many peperomia species grow as epiphytes in the wild. This is similar to the way orchids grow as well: think of a plant nestled in the nook of a tree, sending its roots into some slightly decaying bark. Choose soil that mimics these conditions: chunky, loose, and acidic. An orchid potting medium works well. Regular potting soil is fine too; you can always lighten it with a handful of peat moss or vermiculite. The succulent leaves of peperomia plants indicate that the plants don't need frequent watering to maintain vigor. Allow the surface of the soil to dry out between waterings. Keeping the peperomia on the dry side is better than saturating it, which leads to root rot and fungus gnat problems. Peperomia plants are only hardy down to USDA growing zone 10, which means they cannot be exposed to temperatures less than 30 degrees F. As tropical plants, peperomias like it warm and steamy, especially in the summer months when growth is most active. If your plant doesn't get an outdoor vacation in the summer, place it on a tray of pebbles and water to increase ambient humidity. When it comes to fertilizing, less is more for the peperomia. Discolored or dropping leaves are usually a result of inadequate light or excessive watering, not poor nutrition. As a slow-growing epiphyte, the peperomia can go its entire life without supplemental fertilizer, getting what it needs from its planting media. Peperomia plants may live for years in a relatively small container. They enjoy a somewhat root bound existence, and this combined with their slow growth rate means you can let them be unless you see roots coming out of the drainage holes. Repot in a slightly larger container with an acidic potting mix or orchid bark. Because of their thick, succulent nature, peperomia plants are easy to propagate by vegetative methods. Cut a leaf with an inch of stem from the mother plant in the spring, when growth is most active. Place the stem in a small container of sterile potting soil. Keep the soil constantly moist; you may cover the cutting with a cloche or a clear container to retain moisture. Roots will form in a few weeks, and you may transplant the cutting when it outgrows its initial container. Belly Button Peperomia has a compact form and tiny leaves somewhat reminiscent of the baby tears plant. Colombian Peperomia dazzles with tricolored foliage of bronze, silver, and red. Cupid Peperomia is an ideal specimen for hanging baskets, with heart-shaped leaves edged in cream on trailing stems. Peperomia Perciliata seems like an understated houseplant with its green leaves and red stems, but then a proliferation of flowering spathes add personality. 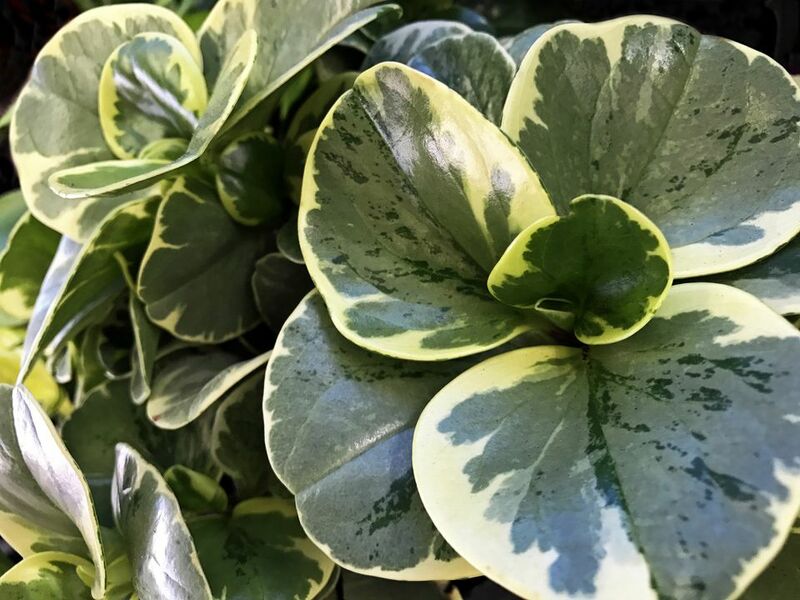 Suzanne Peperomia resembles Rex begonias, with its deeply ridged foliage and silver accents. Unlike the full size rubber plant, Ficus benjamina, the baby rubber plant is safe and non-toxic for cats and dogs. In fact, one study claims that peperomia plants can serve as a leafy vegetable for populations in its native habitat. However, peperomia plants are not meant to be grown for human consumption. Container culture is the most popular way of growing peperomia plants, as it allows the gardener to cultivate and maintain this slow-growing houseplant over many seasons. Choose a container that has excellent aeration to contribute to a healthy root system. An orchid pot, with its large openings, is suitable, provided you use orchid bark that won't fall out of the drainage holes. Terra cotta pots are also excellent containers for peperomia, as their porous nature keeps soil from getting soggy in the event of overwatering. In spite of the common name "baby rubber plant," peperomia plants are not related to rubber plants, nor are they even in the same genus. Rubber plants are in the fig (Ficus) genus, while peperomia plants are their own genus with hundreds of species. The rubber tree is capable of growing 100 feet tall, while the baby rubber plant will grow happily in a pot for its entire life cycle. Know which one you're buying, or you may have to re-home your rubber tree as it grows.